I picked up a old Blazer on the side of the road for $500. The guy selling it said the A/C only blows ice cold when it's under 90 outside. Otherwise the compressor sounds like it's going to grind itself up at red lights. I confirmed this on my gauges, in the morning when it is 80 outside, the low side is 35psi, and when it is 95-100 outside the low side is 55 psi. If I spray the condenser with water the compressor gets quiet again. I replaced the compressor, dryer, and the orifice tube and it still does the same thing. The guy had R134A with ester oil in it with a blue orifice tube. I put R12 back in, used ester, and a new blue orifice tube. Same thing, will blow 37 degrees in the morning but only 55-60 in the afternoon. An A/C shop told me to use a GM yellow one as it is smaller. Should I try one of those, or use a variable orifice tube designed for 105+ climates? In the morning on low fan the accumulator will do this, but once it gets 95+ outside the thing will barely sweat. What do the high side pressures look like when it quits cooling? When it is cooler outside, Low side 35, high side 210. When it gets around 95 outside, low side 55, high side 260. If I spray the condenser with a hose, the pressures go all the way down to 30 low, high 195. I talked to a A/C guy and he said most 1st gen S10s have this problem and there is no fix for it. Just a poorly deigned system he said. That's why I am asking if a smaller orifice tube would help? I know many people do this with R134A conversions, but I am using R12 though. You have already answered your own question. Not enough condensor airflow. When GM crammed that 4.3 into the S10, it suffered from airflow issues. You need to make sure the fan shroud is in place, and that all of the heat exchangers are clean & free of bugs & debris in the air path. Clean the air path well, don't assume it is ok because the surface looks clean. The fan clutch needs to be replaced. Make sure you use an OEM or severe service unit. Make sure you have the OEM 5 blade fan, not the 3 blade unit. No flex fans or snake oil. The fan should sound like a Cessna on a cold start, and when it locks up. Avoid the "white box 30 buck special" the chain stores want to sell you. RockAuto sells OEM clutches. In some climates an additional electric pusher fan can help. Replacing the OEM condensor with a parallel flow unit can also be done. My aunt and uncle had a 1987 Blazer and even brand new for some reason the air didnt cool super well in that vehicle. My 1985 Caprice even is good but just. That has R-134. Funny the 1981 Bonneville I also have with R-134 will freeze you out even on a 90+ degree day. Wonder why? Sounds backwards to me, if you want lower pressures need a larger orifice than a smaller one, go back to stock. But CCOT systems are backwards anyway, according to our GM manual if you charge on the high side, low pressures can get up to 65 psi, you don't get any cooling with those kind of pressures. In a similar vehicle we found the space between the condenser and radiator was more than half full with debris. Bohica makes a good point about the shroud and having a good fan clutch. Yet another factor on these vehicles is the color of it, a black vehicle can have a skin temperature 60*F hotter than a white one, besides repainting it, should only drive at night. If you can hold the low side at 50 psi, least can get a 60* breeze to your face. Never liked driving this thing on a 100*F day, but worked much better at night. But hey, it had 4WD, really need that when driving on an interstate on a hot summer day. A smaller orifice tube can lower your low side pressure a little and raise you high side some. 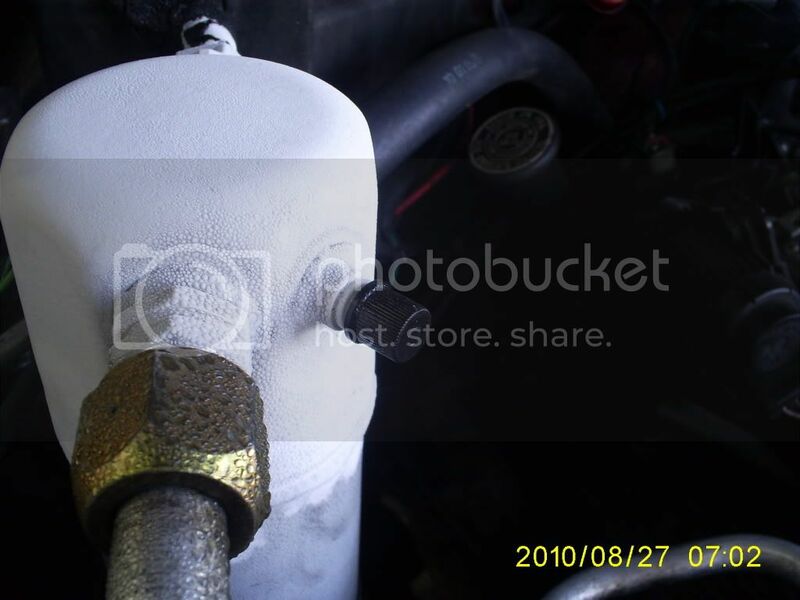 Some people recommended changing the GM white orfice tube to a Ford blue when retrofitting. You should definitely go back to the original orifice tube. That could be part of the reason that your accumulator is icing. I agree with the other guys about the condenser and fan clutch. Make sure there is no debris between them and carefully blow the fins out. A smaller orifice can lower your low side pressure? I must be cracking up, used in a conversion like you stated but to increase the low side pressure. Just can't jam in enough R-134a to get a decent sizable low side pressure so excessive cycling occurs at cooler ambients. What is lowered are the trip points of the cycling switch. GM white is 72 mils diameter, Ford Blue is 67 mils. But agree, go back to the GM white. And more flow reduces both the low and high side pressures, not just one or the other. Would both be near zero if the orifice was eliminated. The accumulator usually frosts over when it gets a lot of liquid overflow that the evaporator didn't evaporate. The liquid evaporates in the accumulator and freezes it up, just like when recharging, the can in your hand gets cold when the liquid inside is evaporating into the system. This can be caused simply by too much refrigerant flow into the evaporator for the heat load it is handling. It can't boil off all the liquid. A stopped blower fan will do that. So will running the AC on low when its cool outside. A defective (stuck open) expansion valve will do that too. In really bad cases where the evaporator is completely flooded and NO evaporation takes place - neither will any decent cooling. I would guess (from this evidence) that a too large Otube for the system design would help to create this problem too. I think I found the problem, I was under the truck doing a oil change today and noticed the whole bottom left side of the shroud was busted out. The fan is almost rubbing on whats remaining of the left side, and there is a big gap between the fan and the shroud on the right side. Must of busted a motor mount and the engine shifted. Once I replace that it should work better. I was also thinking installing a pusher fan on the condenser. Idling in my driveway today, I stuck a box fan in front of the condenser, and the vent temps were 37 on high fan. Would go down to 29 if I stuck in on low. These are the same temps I get driving around, just at red lights it will go from around 30 degrees all the way up to 60. Once you start moving it will go back down to 30.